From the Pilothouse with Sucia Islands on the horizon. It's 730. We left about 6pm from Anacortes and we are northbound on the flood tide to a Sucia Island anchorage. Will arrive at sunset and anchor for the evening. The big wide open ocean is flat and we don't expect any south chop this evening. Tomorrow we'll get out early and work our way up to Vancouver so we can do our Canadian Customs plant dance. Drove the Honda Element, loaded with more boat stuff, 1200 miles from California to Anacortes over Wednesday and Thursday. Pat shopped Trader Joes, Fred Meyer and our favorite homemade pie store today. We loaded 1200 gallons of diesel and many containers of provisions. Spent $6,000 on food and fuel, a couple thousand more than last year. We're happy to be off the dock. See you tomorrow in the City. 2012 marks our 4th Alaska Cruise and Alex's 35th year of boating and boat ownership. Beginning in 1977, he began cruising then racing sailboats. Power boat charter cruising came next in the mid-1980's and continued during the summers. Wild Blue arrived in 2005 and today the boat has just about 2400 hours of running time, or roughly 20,000 cruising miles. Our 2012 Alaska Cruise begins this month, on Saturday, April 28th. As usual, the Wild Blue had a few cruises this winter. Our 2012 New Year's Cruise took us along southern Vancouver Island's eastern shoreline visiting Ladysmith, Chemainus, Genoa Bay, Tod Inlet and Butchart Gardens, Victoria. Then back to the US and Friday Harbor, Rosario Resort, La Conner and Anacortes. 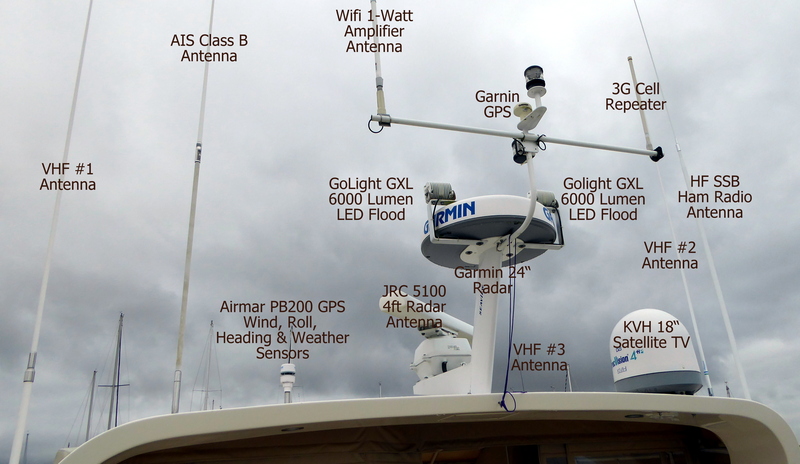 We travelled with a small fleet of Selene's consisting of the Selene 55 Spirit, the Selene 50 Seeker and the Selene 48 Z-Worthy. Unfortunately Z-Worthy lost her rudder on the way to start the cruise, but Ron and Bonnie joined the group as crew. You can read all about it on the Z-Worthy Blog. In February, Pat and Alex took a short cruise to Port Townsend and Poulsbo, spending some good times in these port communities. We left the boat in Poulsbo and returned to California. Change engine and transmission lubricants. On the hard in the yard! While the boat was in the yard on the hard, Brian at Canvass Supply Seattle took our fly-bridge canvas top and gave it a tummy tuck. He also reupholstered the guest berth cushions. Pat upgraded some carpets and artwork. These gave the Wild Blue a "like-new" feel. 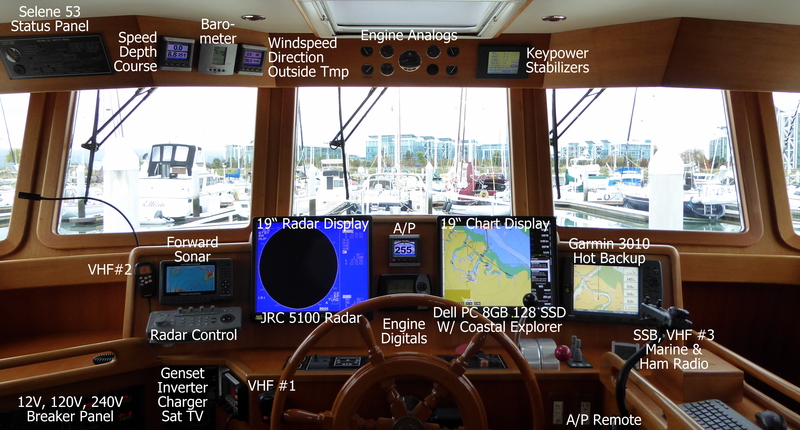 Alex completed some improvements including replacing the seal-a-meal machine, installing new navigation laptop, configuring the old laptop as a hot backup, installing a fish cleaning table, adding to the salmon lure collection and installing an engine room video camera. 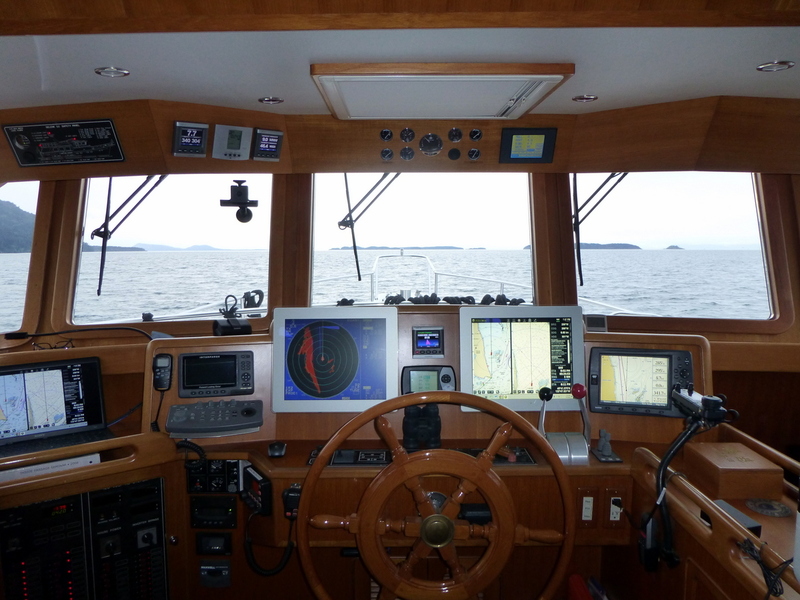 Alex then delivered the boat back to Anacortes and was invited to Mickie and Charter Capt. Jay Field's for Easter dinner. And just like last year, the skipper of Alaska Ocean, America's largest commercial fishing ship, Capt. Scott Symonds joined us for a great dinner. The ship provides the main ingredient of McDonald's famous Fillet-O-Fish sandwich. You can see this fish boat and Capt. Scott on a National Geographic video on Youtube. After dinner everyone swapped their favorite sea stories, but no one could top Captain Scott's Bering sea storm of 90 knot winds, buckled in a helm chair, riding out the seas. As we arrived in Princess Louisa Inlet last September on the last leg of our 2011 Alaska Cruise, a watching boater snapped a fine photo of Wild Blue. 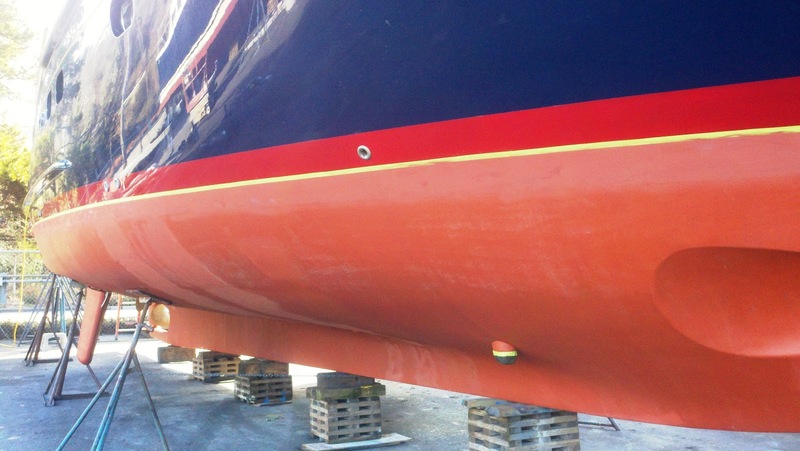 The photo was submitted to the Trawler Forum website and now serves as their logo background. Thanks to Richard on the trawler Tonic, you can see his work and Wild Blue on the Trawler Forum website. Unlike past Alaska cruises, our 2012 Cruise will be a clockwise tour of Southeast AK, visiting Sitka just after Ketchikan. This more conventional route follows the peak King salmon run and allows bear viewing during the July and August runs at Pack Creek and Anan Bay. For the first time our family will be joining us during an Alaskan Cruise. Son Max and his girl Katie will cruise with us from Sitka to Juneau, and son Ryan and his fiancee Cailin will be with us from Petersburg to Ketchikan. The regular Wild Blue crew is back for more including, the San Luis Obispo cowboys and cowgirls, the turkey and chicken farmers, the Simi-Valley folks, and a new crew, the Baron Canyon ranchers. Once again we look forward to sharing our stories. 1. SAT-APR 28 ANACORTES, WA TO SAT-MAY 5 PORT MCNEIL, BC. Northbound BC cruising with Vancouver and small resort visits, prawning and crabbing. 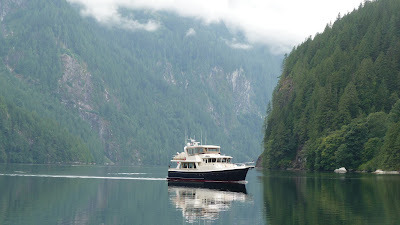 Vancouver, Gorge Harbor, Desolation Sound, Broughton Islands, Port McNeil – 8 days. 2. MON-MAY 7 PORT MCNEIL, BC TO THU-MAY 17 KETCHIKAN, AK. Northbound BC cruising, anchoring at night with Prince Rupert and small town visits, prawning and crabbing. Port McNeil, Namu, Shearwater, Boat Bluff/Alexander Inlet, Hartley Bay, Prince Rupert, Dundas Island, Ketchikan – 11 days. 3. WED-MAY 30 KETCHIKAN, AK TO FRI-JUN 8 SITKA, AK. Northwest bound Alaska cruising, anchoring at night, visit to Craig, fishing, prawning and crabbing, El Capitan Cave exploring: Ketchikan, South Kaigani Harbor, Craig, El Capitan Cave, Port McArthur or Kell Bay, Port Alexander, Red Bluff Bay, Warm Springs Bay, Peril Strait, Kalinin or Fish Bay, Sitka – 10 days. 4. SUN-JUN 10 SITKA, AK TO FRI-JUN 22 SITKA, AK. Cruising the northwest coastline of Baranof Island with King Salmon fishing in waters north of Sitka, anchoring at night, visit to a hot springs and small town of Pelican: Sitka, Kalinin Bay, Piehle Passage, Ford Arm, Baker Cove, Ilin Bay, Mirror Cove, White Sulfur Hot Springs, Pelican, Double Cove, Sitka – 13 days. 5. SUN-JUN 24 SITKA, AK TO WED-JUL 4 SITKA, AK. Cruising the southwest coastline of Baranof Island with King Salmon fishing in waters south of Sitka, anchoring at night, hot springs visit, Sitka Firework show (JUL 3): Sitka, Goddard Hot Springs, Shamrock Bay, Jamboree Bay, Whale Bay, Secluded Bay, Scow Bay, Kidney Cove, Sitka – 11 days. 6. SAT-JUL 7 SITKA, AK TO SAT-JUL 14 JUNEAU, AK. Northeast bound Alaska cruising, anchoring at night, with King salmon and halibut fishing, crabbing, visit to Tenakee Springs and Juneau: Sitka, Peril Strait at Baby Bear Bay, Killisnoo Bay, Tenakee Springs, Crab Bay, Hawk Inlet, Auke Bay, Juneau – 8 days. 7. SUN-JUL 15 JUNEAU, AK TO TUE-JUL 24 PETERSBURG, AK. South bound Alaska cruising, anchoring at night, with salmon and halibut fishing, crabbing, glacier visit, up close brown bear and whale viewing, visits to Juneau and Petersburg: Juneau, Taku Harbor, Fords Terror, Endicott Arm and Dawes Glacier, Tracy Arm Cove, Pack Bay (2 nights), Cape Fanshaw Anchorage, Petersburg – 10 days. 8. THU-JUL 26 PETERSBURG, AK TO SUN-AUG 6, KETCHIKAN AK. South bound Alaska cruising, anchoring at night, with salmon and halibut fishing, crabbing, up close brown bear viewing, visits to Petersburg, Wrangell and Ketchikan: Petersburg, Wrangell, Olive Cove in Zimovia Strait, Anan Bay-Dewey Anchorage, Meyers Chuck, Karta Bay, Hollis Anchorage, Polk Inlet, Ketchikan – 11 days. 9. WED-AUG 8 KETCHIKAN, AK TO FRI-AUG 17 TO SHEARWATER, BC. Northern BC Southbound, anchoring at night, Coho salmon run fishing at Lowe Inlet, crabbing and prawning, and a visit to Prince Rupert: Ketchikan, Prince Rupert, Baker Inlet, Lowe Inlet (2 days), various northern BC ports, Shearwater – 10 Days. 10. SAT-AUG 18 SHEARWATER, BC TO WED-AUG 29 ANACORTES, WA. Southern BC Southbound cruising, anchoring at night, salmon fishing, visits to small boat resorts and Vancouver: Shearwater, Ocean Falls, various coastal BC ports, Port McNeil, Lagoon Cove, Desolation Sound, Smugglers Cove, Vancouver, Anacortes – 12 days.